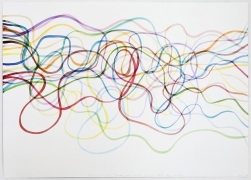 SPENCER FINCH Forecast (Jet Stream Over North America, 10 1/2 days Ahead) 2013 Watercolor on paper 29 1/2 x 41 1/4 in. 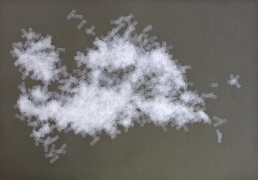 SPENCER FINCH Cloud (Giverny) 2013 Scotch tape on paper 27 1/2 x 39 3/8 in. 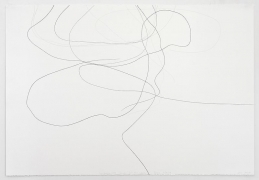 SPENCER FINCH Vultures Over Canyon del Rio Lobos, Spain 3/30/13 1591F 2013 Pencil on paper 30 1/4 x 44 in. SPENCER FINCH Vultures Over Canyon del Rio Lobos, Spain 3/30/13 1593F 2013 Pencil on paper 30 1/4 x 44 in. SPENCER FINCH The Garden of Eden (All the Colors in my Paintbox) 2013 Watercolor and pencil on paper 50 3/4 x 68 in. 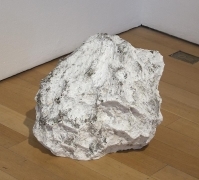 SPENCER FINCH Lump (of concrete) Mistaken for a Pile (of dirty snow) #1 2010 Concrete, marble dust, street dirt 15 x 16 x 14 in. 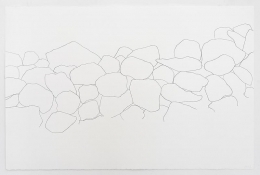 SPENCER FINCH Stone Wall, CT 2013 Pencil on paper 26 1/4 x 40 in. 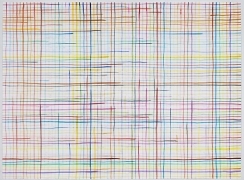 SPENCER FINCH Wind (Barcelona) 2013 Pastel on paper Diptych, each: 26 1/4 x 26 1/4 in. 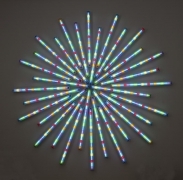 James Cohan Gallery is pleased to present Fathom, Spencer Finch’s debut solo exhibition at the gallery, opening on Thursday, May 2nd and running through Saturday, June 15th. An opening reception for the artist will take place on May 2, 2013, from 6 – 8 PM. To “fathom” is to comprehend the essence of something colossal or ineffable by translating it into terms we can grasp. For more than twenty years, Spencer Finch’s practice addresses such a need to capture and frame experience. 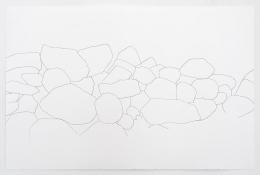 In site-specific installation as well as drawing and sculpture, Finch has combined scientific calibration and calculation with a romantic’s engagement with nature and faith in the limitless rewards of observation. A fathom is also a unit of measurement approximately six feet in length that is used to measure the depth of water, and a key reference point for the exhibition. After learning about Henry David Thoreau’s 1846 survey of Walden Pond, in which the famed polymath performed soundings to determine the lake’s depth at 102 feet and debunk a popular myth that it was bottomless, Finch received permission from the Walden Pond State Reservation to take a boat on the lake and perform that seminal survey for the second time. Dropping rope into the pond, as Thoreau had, while also employing an electronic depth meter — combining old and new technology — Finch further measured longitude and latitude as well as color-matching the water at each sounding point. The resulting work is a 120-foot long rope – the rope Finch used in the soundings, and the artist's description of the depth of Walden Pond. 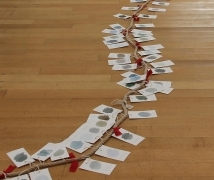 It serves as the physical record of the findings as well as an armature: paper tags for each of the approximately 700 soundings appear along the rope at their equivalent measure of depth along with their exact coordinates and a swatch of matched color, applied in watercolor. 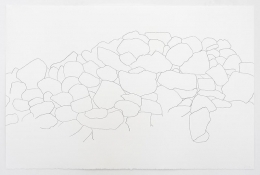 Neither entirely documentation nor sculpture, the long line may best be considered a drawing of Walden Pond. 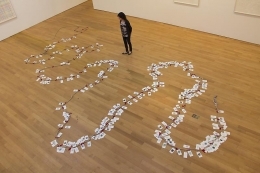 The main gallery will include several other works delving into the idea of delineation, from continuous-line drawings of encircling vultures observed by the artist in Spain to abstract renderings of meteorological models used to predict weather patterns. 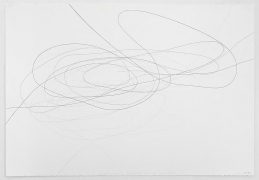 Other new and recent works on view for the first time in New York address themes as varied as the color of the light on Mars, the breeze through Emily Dickinson’s bedroom window and the attempt to render wind through chalk exhibitionsel drawings of the movement of the curtains at Ludwig Mies van der Rohe’s famous pavilion in Barcelona.